WASHINGTON (CNN) -- The National Transportation Safety Board began four days of hearings Tuesday on how to stem the "drastic increase" in medical helicopter accidents. 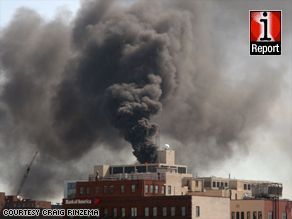 Smoke rises from Spectrum Health Butterworth Hospital in Grand Rapids, Michigan, after a helicopter crash in May. Over a recent 12-month period, the board probed nine fatal medical helicopter accidents that killed 35 people, a development that one board member called "alarming." Medical helicopters "provide an important service to the public" in swiftly transporting ill and injured patients and donor organs, the board said on its Web site. Chopper pilots must operate "safely and quickly" in bad weather, at night or on "unfamiliar landing sites," the board added. A December 2007 accident in Cherokee, Alabama, was likely caused by the pilot flying too low over trees, the NTSB said. The helicopter was shining a searchlight on a hunter who had been lost as rescue personnel on the ground tried to reach him. The pilot, a paramedic and a flight nurse were killed, the NTSB said. Among the issues to be discussed at the hearing will be flight operations, aircraft safety equipment, training and oversight. Expert witnesses such as pilots, medical personnel, managers and Federal Aviation Administration officials will give sworn testimony on what has been an "ongoing concern" of the safety board, which issued a report on emergency medical services operations in 2006. The NTSB said there were 55 EMS-related aviation accidents -- both fatal and nonfatal -- between January 2002 and January 2005 that could have been prevented with "simple corrective actions." In those crashes, 54 people were killed, and 18 were seriously injured, the NTSB said. The agency recommended to the FAA in January 2006 that all medical chopper operators be required to develop and implement risk evaluation programs, use dispatch and flight procedures that include up-to-date weather information, and install "terrain awareness and warning systems" on their aircraft. A fourth recommendation would require medical flight operators to follow federal regulations regarding their flights. The recommendations have not been fully implemented, the NTSB said.